I rarely splurge on books anymore. It’s probably something I don’t spend enough on. When I heard that Darryl Strawberry was coming out with his version of a tell all book, I knew I had to get it and that it would be an easy page turner for me no matter what it had in it. Afterall, I owe a lot to Darryl for me falling in love with the sport as an 8 year old kid. He was my first favorite player. I’d spend the night at any home with cable if the Mets or Dodgers were playing just to see him hit. I’d comb box scores every morning looking for ‘Strawberry’ and I’d cut out the good ones and pin them to a bulletin board in my room next to the magazine I had with the Straw on the cover. 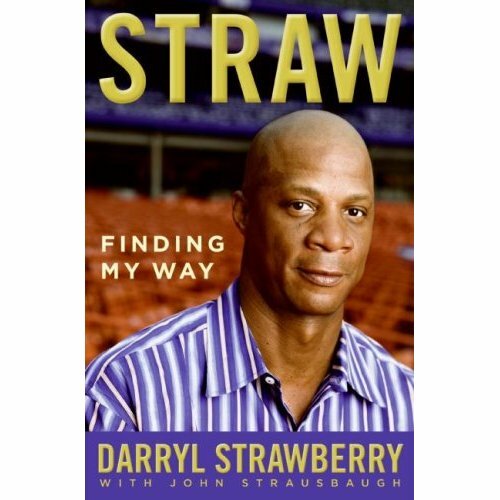 Straw: Finding My Way is not just a book about baseball. It’s a book about life with some baseball included. I’d encourage anyone who has ever struggled with any degree of addiction in their life to read this book. No one was a bigger addict then Strawberry himself, and he admits that a lot in the book. This is not a book that will only be interesting to baseball fans, but should also be interesting to people from all walks of life because of this very reason. When I read through the book, I kept thinking about what someone had once said about the late country singer Johnny Cash. Strawberry, like cash is not a bad man who struggled to be good. He is a good man who has struggled to face many of life’s challenges. Strawberry chronicles a life that had him growing up in South Central Los Angeles, in the one of the stucco homes with a little back and front yard. Strawberry gives a lot of mention to the absence of his father in his life being the cause of not only his own but his brother’s problems as well. Strawberry was a member of possibly the greatest varsity high school baseball team of all time, the late 70’s Crenshaw Cougars. Strawberry tells the story of him going from a cocky and brash high school player to the #1 pick in the draft, expected to save the New York Mets franchise almost single-handed. From there Strawberry was thrown into a life of hard partying and fast women as a young man, a kid basically. Strawberry was introduced to this lifestyle by the ‘wild hairs’ (as he referred to them) that he called teammates. The Mets were unlike any team that is in the game today. Times were different then. Cigar and Cigarette smoking was common for every player in the dugouts, clubhouse, team bus, and even airline flights. Life was a constant routine of going to the ballpark by day and tearing up the town’s clubs and bars by night. The book is written in very simple tense. Strawberry will never be mistaken for Shakespeare and he a lot of times writes as if he were sitting next to you with a beer in hand telling you a story. One thing I found to be a disappointment was that the 1986 World Series was summed up by Strawberry in basically a paragraph. He did not go into detail about the battles and the whole legendary 1986 season and team is basically talked about in less then a chapter of this book. I suppose it is good in some ways as if you’ve read The Bad Guys Won by Jeff Pearlman (my favorite book of all-time) a lot of things seem to overlap and you can tell Strawberry has read that book and taken some very things that Pearlman has said and made them his own anecdote. For all the chapters in this book that are really interesting; it is the final three chapters that are the most important. Strawberry sends a message that is priceless if you can harness it. Strawberry is an amazing human being. He is amazing because of his imperfections. In a movie or story it is the hero or character you know that has a tragic downfall coming that you end up loving and pulling for the most. It is amazing because in his story, Strawberry seemingly fails again, and again, and again, and even more. When you think he’s finally turned the corner, you read that he slipped again back into his demons and addictions. While being a specimen of superstar caliber, he is a man who is not immune to the temptations that we regular people face every day of our lives. And that’s what makes you relate to ‘Straw’. Strawberry gets sick. He gets high. He goes to bed with women at his treatment facilities. He doesn’t pay his bills. He is a cornicopia of all things humanly imperfect. And it is amazing to have read his story and know that he has truly come full circle within the years I have been on this earth. I have seen it happen now. I remember as a kid and then as an adolescent and even as a young man shaking my head every time I heard that Darryl Strawberry had slipped again. He was my first favorite player. My initial connection to the sport I loved. In my head, I would always hope that he’d ended up alright but I didn’t see it happening. In the end, Strawberry has pulled through. All in the same, he admits that he doesn’t know if tomorrow will be a day of clean living. You’re not living in yesterday or tomorrow. Today is all you’ve got, and how you live today is all that matters. That is the quote that stuck with me through this inspiring story. Strawberry reminds us that the Devil is very real; and that he is around every corner. He’s not just preying on us when we are at our weakest, but that he is coming at us often when we’re at our strongest. I may have read this story because I loved baseball, but this is a story that could change the way someone lives their life. There are a lot of lessons to be learned if you take Strawberry’s words to heart. He is a man who has walked on both sides of this life, not ignoring either extreme. As I read on towards the end of the book, I became increasingly amazed that this man is alive to tell his story. I have to figure the only reason is because of God, and because Darryl’s number wasn’t called for a reason yet. Strawberry’s purpose on earth wasn’t to hit all those home runs at Shea Stadium or to be at Yankees Old Timers days. It was to tell his story and inspire lives young and old. He’s done it.